Working with nuggets is a good way to get started in stained glass because it requires no glass cutting, is a low-budget undertaking, and shows quick results. Somewhat addictive, it is a pleasant way to spend a rainy afternoon. 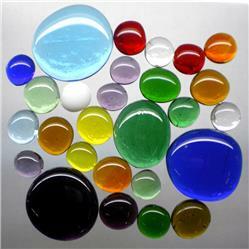 Glass rondels are circular pieces of glass that have been formed into a disc shape. They can be blown or spun. Kokomo Opalescent Glass has a good description of the difference here. A rondel resembles the base of a wine glass, but it's more interesting. Because it is handmade, it will have swirls and bubbles that catch the light and make each rondel unique. 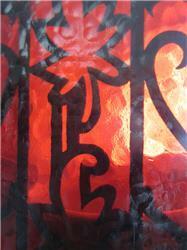 Glass rondels may be easily foiled or leaded, and incorporated into a larger work. 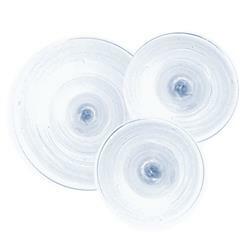 Our blown clear rondels are currently available in three sizes, 3", 4" and 6". Our spun colored rondels are 4" in diameter. Clear glass bevels were used in relatively large quantities in Victorian era windows. Many beautiful examples survive today in fine old houses and older public buildings such as libraries, schools and municipal buildings of various types. These high quality groups of beveled glass pieces are intended as centerpieces for ornate windows, sidelights or transoms. You can design any sort of surrounding area as a background, using clear glue chip, opal, or cathedral glass in limitless design. These bevel clusters are 3/16" thick, and the beveled edge is 1/2" wide. During the Victorian era, stained glass artisans often included glass "jewels" in the windows they created for their wealthy patrons. These craftsmen used the jewels to create a frame to encircle important parts of the design, or studded the repetitious border with jewels, alternating them with plain strips of colored glass. They might also use these jewels to depict the centers of flowers, or to emphasize important centers of interest. GLASS GLOBS, or "Nuggets" if you prefer a more elegant term. These are oval to circular glass drops with a flat back. No two are exactly alike, because they are made in somewhat the same way cookies are made, on a sheet in an oven. LAMPSHADE FRUITS - Curved panes made in the shape of fruit. 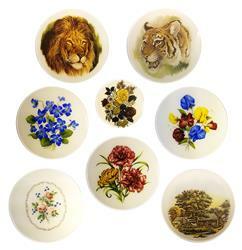 These are exact replicas of the pieces used in the shades of the turn of the century. 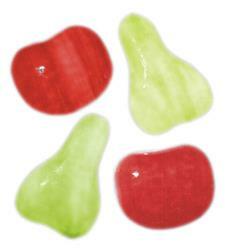 Made from 1/8" opalescent glass in suitable colors. Hundreds of thousands of stenciled glass pieces were used in stained glass windows during the latter 19th and early 20th centuries . Many can be seen today in older churches. This series contains items of interest for the whole family and then some. The black enamel is fired on at temperature of 1300 degrees so that it becomes part of the surface of the glass These silhouette medallions are suitable for wrapping in lead and hanging alone, or for inclusion in a larger panel or window. You may choose between clear seedy glass or medium amber crape pattern for any of this selection. A silhouette medallion, used properly, can economically transform a simple window project into an interesting study. These versatile discs are flat, clear window glass onto which multicolored figures and scenes are fired on at 1200 degrees so that the subjects actually fuse to the glass to become part of the surface. Some appear to have the design painted and fired onto the front surface, and some have a decal against a white background fused on the back surface. You can wrap a single one in lead or foil and hang it to catch the sun in your window, or you can incorporate it into a larger project by adding a border.